51. A client develops decreased renal function and requires a change in antibiotic dosage. On which factor should the physician base the dosage change? 52. A history of infection specifically caused by group A beta-hemolytic streptococci is associated with which of the following disorders? 53. A client admitted with a gunshot wound to the abdomen is transferred to the intensive care unit after an exploratory laparotomy. I.V. fluid is being infused at 150 ml/hour. Which assessment finding suggests that the client is experiencing acute renal failure (ARF)? 54. A nurse is reviewing the laboratory test results of a client with renal disease. Which of the following would the nurse expect to find? 55. Which type of medication may be used in the treatment of a patient with incontinence to inhibit contraction of the bladder? 56. After teaching a group of students about the types of urinary incontinence and possible causes, the instructor determines that the student have understood the material when they identify which of the following as a cause of stress incontinence? 57. After undergoing retropubic prostatectomy, a client returns to his room. The client is on nothing-by-mouth status and has an I.V. infusing in his right forearm at a rate of 100 ml/hour. The client also has an indwelling urinary catheter that’s draining light pink urine. While assessing the client, the nurse notes that his urine output is red and has dropped to 15 ml and 10 ml for the last 2 consecutive hours. How can the nurse best explain this drop in urine output? a. It’s an abnormal finding that requires further assessment. b. It’s a normal finding caused by blood loss during surgery. c. It’s an abnormal finding that will correct itself when the client ambulates. d. It’s a normal finding associated with the client’s nothing-by-mouth status. 58. The nurse is caring for a client who is scheduled for the creation of an ileal conduit. Which statement by the client provides evidence that client teaching was effective? 60. The most common presenting objective symptoms of a urinary tract infection in older adults, especially in those with dementia, include? 61. Which of the following would be included in a teaching plan for a patient diagnosed with a urinary tract infection? 62. The following catheterization procedures are used to treat clients with urinary retention. 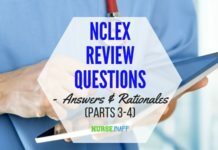 Which procedure would the nurse identify as carrying the greatest risk to the client? 63. A client with urinary tract infection is prescribed phenazopyridine (Pyridium). Which of the following instructions would the nurse give the client? 64. A nurse has been asked to speak to a local women’s group about preventing cystitis. 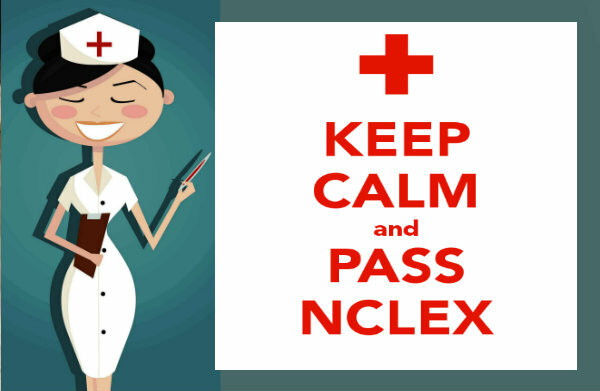 Which of the following would the nurse include in the presentation? 65. Which of the following is a factor contributing to UTI in older adults? 66. You are caring for a 72-year-old client who has been admitted to your unit for a fluid volume imbalance. You know which of the following is the most common fluid imbalance in older adults? 67. A nurse reviews the arterial blood gas (ABG) values of a client admitted with pneumonia: pH, 7.51; PaCO2, 28 mm Hg; PaO2, 70 mm Hg; and HCO3–, 24 mEq/L. What do these values indicate? 68. You are caring for a client with severe hypokalemia. The physician has ordered IV potassium to be administered at 10 mEq/hr. The client complains of burning along their vein. What should you do? b. Switch to an oral formulation. c. Increase the speed of transfusion. 69. The calcium level of the blood is regulated by which mechanism? 70. A client has the following arterial blood gas (ABG) values: pH, 7.12; partial pressure of arterial carbon dioxide (PaCO2), 40 mm Hg; and bicarbonate (HCO3-), 15 mEq/L. These ABG values suggest which disorder? 71. To compensate for decreased fluid volume (hypovolemia), the nurse can anticipate which response by the body? 72. A client comes to the emergency department with status asthmaticus. His respiratory rate is 48 breaths/minute, and he is wheezing. An arterial blood gas analysis reveals a pH of 7.52, a partial pressure of arterial carbon dioxide (PaCO2) of 30 mm Hg, PaO2 of 70 mm Hg, and bicarbonate (HCO3? ?’) of 26 mEq/L. What disorder is indicated by these findings? 73. A client hospitalized for treatment of a pulmonary embolism develops respiratory alkalosis. 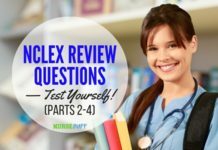 Which clinical findings commonly accompany respiratory alkalosis? 75. A physician orders regular insulin 10 units I.V. along with 50 ml of dextrose 50% for a client with acute renal failure. What electrolyte imbalance is this client most likely experiencing? 76. A client in the emergency department reports that he has been vomiting excessively for the past 2 days. His arterial blood gas analysis shows a pH of 7.50, partial pressure of arterial carbon dioxide (PaCO2) of 43 mm Hg, partial pressure of arterial oxygen (PaO2) of 75 mm Hg, and bicarbonate (HCO3-) of 42 mEq/L. Based on these findings, the nurse documents that the client is experiencing which type of acid-base imbalance? a. It obstructs water elimination. b. It can cause dehydration. c. It can lead to weight gain. d. It increases the client’s desire to consume fluid. 78. A group of nursing students are studying for a test over acid-base imbalance. One student asks another what the major chemical regulator of plasma pH is. What should the second student respond? 79. A client with Guillain-Barré syndrome develops respiratory acidosis as a result of reduced alveolar ventilation. Which combination of arterial blood gas (ABG) values confirms respiratory acidosis? 81. A nurse is caring for a client with metastatic breast cancer who is extremely lethargic and very slow to respond to stimuli. The laboratory report indicates a serum calcium level of 12.0 mg/dl, a serum potassium level of 3.9 mEq/L, a serum chloride level of 101 mEq/L, and a serum sodium level of 140 mEq/L. Based on this information, the nurse determines that the client’s symptoms are most likely associated with which electrolyte imbalance? 82. Which conditions lead to chronic respiratory acidosis in older adults? 83. A client with a suspected overdose of an unknown drug is admitted to the emergency department. Arterial blood gas values indicate respiratory acidosis. 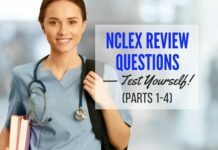 What should the nurse do first? a. Prepare for gastric lavage. b. Monitor the client’s heart rhythm. c. Obtain a urine specimen for drug screening. d. Prepare to assist with ventilation. 84. A priority nursing intervention for a client with hypervolemia involves which of the following? a. Monitoring respiratory status for signs and symptoms of pulmonary complications. b. Establishing I.V. access with a large-bore catheter. c. Encouraging the client to consume sodium-free fluids. d. Drawing a blood sample for typing and cross-matching. 85. A 57-year-old homeless female with a history of alcohol abuse has been admitted to your hospital unit. She was admitted with signs and symptoms of hypovolemia – minus the weight loss. She exhibits a localized enlargement of her abdomen. What condition could she be presenting? 86. The nurse is caring for a client who is exhibiting symptoms of tachypnea and circumoral paresthesias. What should be the nurse’s first course of action? b. Find and correct the cause of tachypnea. c. Administer cardiopulmonary resuscitation (CPR). d. Give a dose of aspirin. 87. A 64-year-old client is brought in to the clinic with thirsty, dry, sticky mucous membranes, decreased urine output, fever, a rough tongue, and lethargy. Serum sodium level is above 145 mEq/L. 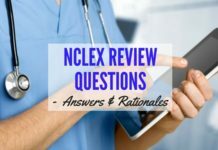 Should the nurse start salt tablets when caring for this client? a. No, start with the sodium chloride IV. b. No, sodium intake should be restricted. c. Yes, this will correct the sodium deficit. d. Yes, along with the hypotonic IV. 88. A client with pancreatic cancer has the following blood chemistry profile: Glucose, fasting: 204 mg/dl; blood urea nitrogen (BUN): 12 mg/dl; Creatinine: 0.9 mg/dl; Sodium: 136 mEq/L; Potassium: 2.2 mEq/L; Chloride: 99 mEq/L; CO2: 33 mEq/L. 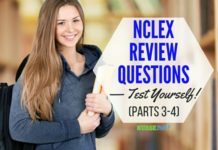 Which result should the nurse identify as critical and report immediately? 89. A group of students are reviewing information about disorders of the bladder and urethra. The students demonstrate understanding of the material when they identify which of the following as a voiding dysfunction? 90. 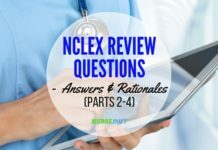 The nurse expects which of the following assessment findings in the client in the diuretic phase of acute renal failure? 91. A male client has doubts about performing peritoneal dialysis at home. He informs the nurse about his existing upper respiratory infection. Which of the following suggestions can the nurse offer to the client while performing an at-home peritoneal dialysis? a. Perform deep-breathing exercises vigorously. b. Avoid carrying heavy items. c. Auscultate the lungs frequently. d. Wear a mask when performing exchanges. 92. A 32-year-old flight attendant is undergoing diagnostics due to a significant drop in renal output. The physician has scheduled an angiography and you are in the midst of completing client education about the procedure. The client asks what the angiography will reveal. What is your response, as her nurse? 93. The nurse observes the color of the client’s urine which appears pale blue-green. The nurse obtains a drug history from the client based on the understanding that drugs used by the client may affect which of the following? 94. A nurse, when caring for a client, notes that the specific gravity of the client’s urine is low. What could have lead to the low specific gravity of urine? 96. Julia Lee, a 57-year-old financial officer, has been exhibiting signs and symptoms which lead her urologist to suspect the adequacy of her urinary function. Beginning with the least invasive tests, which of the following would you expect the physician to prescribe to assess kidney function? Choose all correct options. 97. The nurse is preparing an education program on risk factors for kidney disorders. Which of the following risk factors would be inappropriate for the nurse to include in the teaching program? 98. Which of the following terms is used to refer to inflammation of the renal pelvis? 99. A client with a genitourinary problem is being examined in the emergency department. When palpating the client’s kidneys, the nurse should keep in mind which anatomic fact? a. The kidneys are situated just above the adrenal glands. b. The left kidney usually is slightly higher than the right one. c. The kidneys lie between the 10th and 12th thoracic vertebrae. d. The average kidney is approximately 5 cm (2?) long and 2 to 3 cm (¾? to 1??) wide.